Do you suspect stress has made you gain weight? You’re probably right. 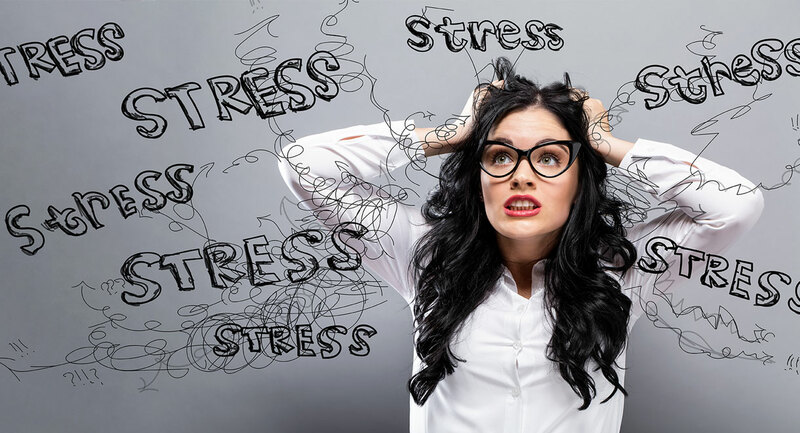 Stress alters a person’s behaviour, but it also causes real hormonal shifts that encourage your body to store more fat. Long term stress eventually causes exhaustion, leaving you unlikely to spend time exercising or preparing healthy meals. Stress can interfere with your ability to sleep, and that raises levels of hunger hormones, making you want to eat more. Stress can also lead to anxiety or depression, which drives emotional eating and food addiction for a large number of people. Stress can also raise your blood level of the hormone cortisol and that can make it almost impossible to lose weight. Cortisol worsens insulin resistance, predisposing an individual to type 2 diabetes. This is especially true if you have been experiencing long term stress and if you carry excess weight on your abdomen. Cortisol is a hormone made by your adrenal glands, which are two glands that sit on top of your kidneys. This hormone is actually made of cholesterol, like a lot of other important hormones in your body. It is normal and beneficial to have some cortisol in your bloodstream at all times. It is supposed to be highest in the morning, to give you some energy and motivation to get out of bed and go to work. Cortisol is supposed to drop off in the evening, in order to help you relax, unwind and get ready to sleep. Problems arise when there is too much cortisol in the bloodstream all day and night. When you feel stressed, your adrenal glands release cortisol and adrenaline in order to give you energy, make you feel more alert and increase blood flow to your muscles (so you can run away from someone who may be chasing you). When the feeling of stress passes, these hormones are supposed to fall back down again and allow you to feel relaxed. Unfortunately some people never feel relaxed; they bounce from one type of stress to the next from the moment they wake up until they collapse into bed at night. Cortisol can raise your blood sugar level. It is supposed to do that in the short term in order to give you energy and stamina, but chronically elevated blood sugar can raise the risk of type 2 diabetes. Cortisol can cause you to lose your waist. It promotes weight gain around the torso. It also promotes fat deposition inside the liver and all around the abdominal organs. This is dangerous because excess weight in that area raises the risk of heart attacks and strokes. Cortisol can make you feel more hungry and crave sugary or salty foods. This is because it impairs the ability of insulin to work in your body. This means glucose has a hard time entering your cells, where it should be burnt off for energy. Consequently your cells end up being starved of energy. This will send signals to your brain telling you to eat something, especially something sugary. I have found the best way to increase the sensitivity of your cells to insulin is by taking the herbal extract called berberine. Berberine makes it significantly easier to lose weight and control blood sugar if you are dealing with stress. Cortisol can suppress your immune system. Cortisol is supposed to reduce inflammation in your body and that is a good thing. Cortisol is used medically for autoimmune disease and conditions marked by excess inflammation. Problems arise if your own body’s production of cortisol remains elevated for an extended period of time. This suppresses the immune system and makes you much more likely to contract infections such as colds and flu. It also means these infections are more difficult to overcome. Apart from trying to reduce your stress level, taking a selenium supplement is the best way to strengthen your immune system. Selenium improves the ability of your body to fight viral infections in particular. Cortisol can interfere with your ability to sleep. If your cortisol level has been too high all day, chances are it does not drop sufficiently at night. This can make it more difficult to fall asleep or it can cause light and broken sleep. You can have a blood test to measure your level of cortisol. You need to have it tested twice in a day; once at approximately 7:30 to 8am and again at approximately 5:30 to 6pm. The most effective and most important way to lower your blood cortisol is to reduce your stress level. This is obviously easier said than done. You may need to change some circumstances in your life, or change the way you perceive these circumstances. However admittedly there are some instances in life where we really don’t have the ability to change our circumstances. In that instance it is important to try and support your body physically as best as possible. Try to get enough sleep, rest and relaxation. Don’t go to bed too late. Try to be in bed by 10:30pm. Melatonin can help you fall asleep and magnesium can help you fall asleep and stay asleep. Do some gentle exercise. Don’t exhaust yourself. Prolonged strenuous exercise can raise cortisol even further. The trick is to just do enough to energise yourself. Follow an anti-inflammatory diet. Excessive inflammation in your body is perceived as a type of stress and therefore promotes raised cortisol. The worst foods for raising inflammation are sugar, dairy products, gluten, margarine, alcohol and any food you are allergic to. Try to minimize your intake of those foods. Instead, try to base your diet on fresh vegetables, good fats (avocados, olive oil, raw nuts, seeds, oily fish, fat from pastured animals, ghee) and good quality protein (poultry, grass fed meat, eggs, whey protein powder). Making your own raw vegetable juices is an excellent way for reducing inflammation. See the recipes in my book Raw Juices Can Save Your Life. Tyrosine is an amino acid that your brain requires for neurotransmitter production. It is needed for dopamine and noradrenalin production. These neurotransmitters help to keep you feeling motivated and improve stress coping abilities. They also reduce stress eating by improving the sense of satisfaction after meals. Chronically elevated cortisol is an extremely common condition among those of us experiencing long term stress. It can have many negative health consequences. Fortunately there are several things you can do about it.